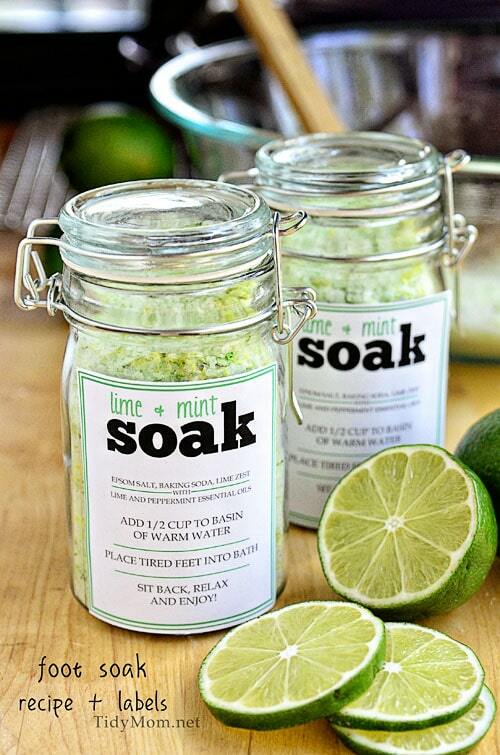 Mother’s Day is May 12th this year, this simple to make Lime & Mint Foot Soak packaged up in a cute jar with a label you can download and print for free would make a great gift for any Mom. 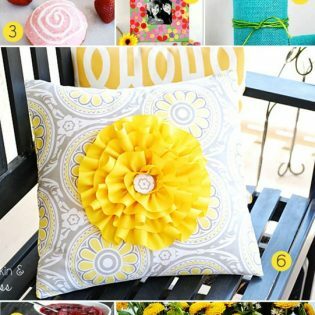 Great idea for Teacher Appreciation Gift too! Most of us are busy and I don’t know about you, but my feet get tired. I’ve always enjoyed counteracting the stress of tired, swollen, achy feet is by soaking them in Epsom salts. Last week when Angie shared a Lime & Mint Foot Soak I thought it would be a great idea to mix up a batch to have on hand while we get ready to move this month. I’m certain I’ll be exhausted and in need of a good relaxing foot soak many nights to come. 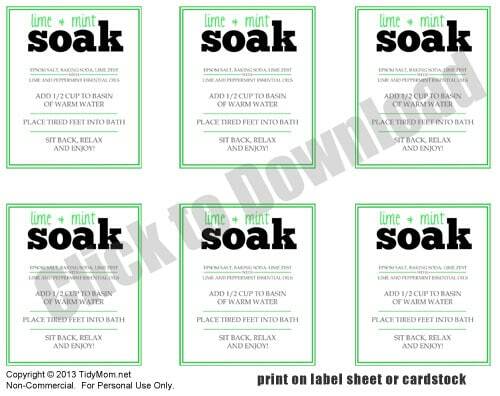 The soothing, homemade mixture of Epsom salt, lime zest and various natural ingredients would also make a welcome gift for Mother’s Day or Teacher Appreciation ; use the Foot Soak Label template as a gift tag or label, and affix it to a jar or bag to treat someone special. To make the foot soak, combine 2 cups of Epsom salts with 1/2 cup baking soda and zest of one lime in a large bowl, and add 3-4 drops of lime essential oil and 3-4 drops of peppermint essential oil. Stir with wooden spoon to mix thoroughly. (optional, you could add just a drop of green food coloring if you’d like) Pour the mixture into a jar or bag, and use within a few weeks. *store in a cool dark place, like refrigerator if using lime zest. If you’d like it to keep longer, omit the zest. Epsom Salt will soothe aches, eliminate smells and softens up rough skin. Baking Soda is good for exfoliating, leaving your skin soft and smooth and helps eliminate odors. 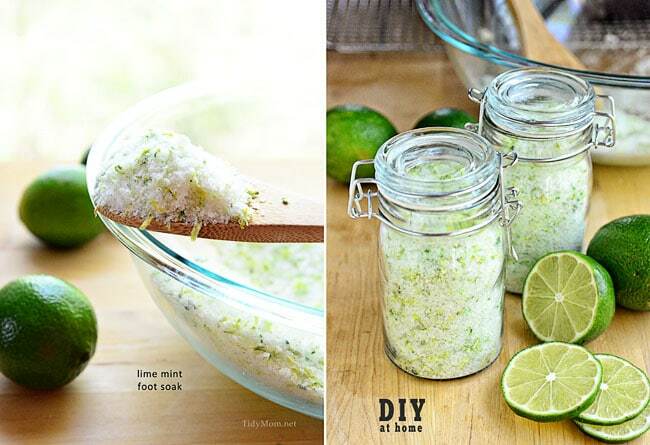 Lime is routinely used for its energizing, fresh and cheerful aroma. It is well known in folklore for its ability to cleanse, purify and renew the spirit and the mind. It is also said to be effective in cleansing the aura. Peppermint is uplifting and fresh. The menthol induces a cooling sensation, and can help to cool you down, help ease tension headaches and muscular aches and pains. Sounds heavenly right? You can’t go wrong with that combo! 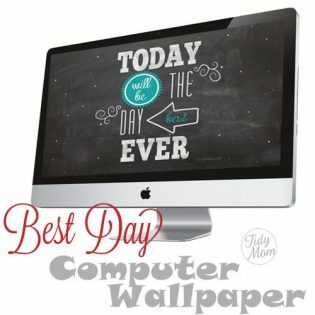 Download the free labels I made here! I picked up my jars at Michaels, the essential oils at a local shop called Herbs & More and the other ingredients at Target. I just found this pin. How long does the product last, how much do you use each time, and finally, does the remainder need to be refrigerated? Thank you. This sounds heavenly. Due to lymphedema my left foot./leg swells along with drier skin. Need to keep skin well moisturized especially in Summer when barefooting around. So glad you shared this, will make some for myself as well as friends. I get really cute round shaped jars 1/2 off at Hobby Lobby, usually have them on sale couple times a month in all sizes. Will need to wait til can afford the oils. Very tasty grilled cheese. Loved it!! Thanks for sharing ???????? Today’s date is 10/13/2018 I want to make this for a Christmas Present. Will it last from now till then in an air tight jar? Do you know how many ounces the jars were that you used? How long would it last with The zest if it isn’t storet in The fridge? ?